My friend, Mordy Plotzker took his family to the Israeli Day Parade and wrote about it. He explains my sentiments exactly and I believe the sentiments of all those that attended. Thanks Mordy. My preface: I've seen the parade myself as a boy, just like I went to the Chabad Lag Baomer parade, these were some of my most exciting memories growing up, but I thought I grew out of it. It was over a year ago that some of our girl campers were sitting around our Shabbos table and the topic of the Israel day parade came up. Some girls were from Bais Yaakov schools and some from more Modern schools. 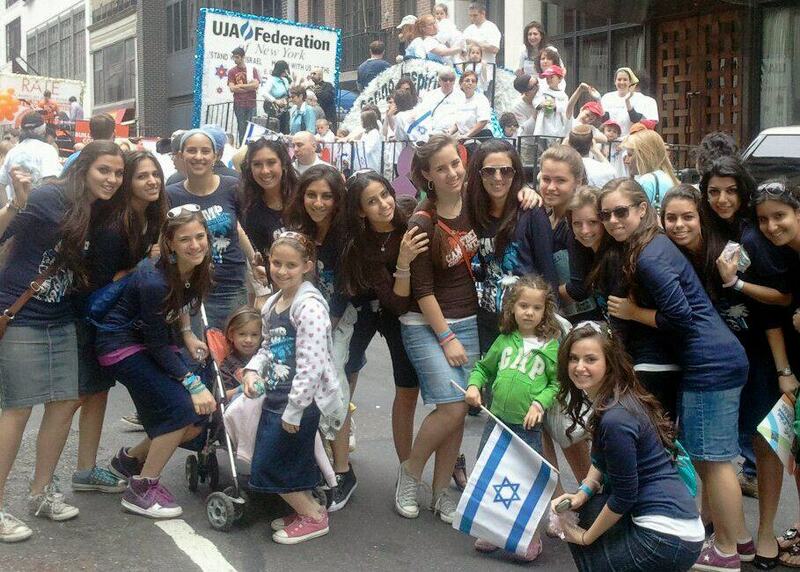 There was a small debate as the Bais Yaakov girls tried to explain why they didn't march. It sounded like they were reading it out of a text book. They were convinced that there would be some kind of anti-religious propaganda behind the parade.I then listened to the girls from schools that did march and were luminescent about it. They explained that it gave them something to be proud of and excited about. The BY girls heard and I could see the envy they had, and that's when I decided that we were going to march! It had been nine years since my last visit to the Israeli day parade when I took my two oldest daughters, aged 3 and 2, respectively. The weather was real nice and we reasoned that we would treat the girls to a memorable outing. So when my wife said, "Let's go" - we went! Nevertheless, getting there was nerve-wracking. Maintaining a safe distance to the tracks, seating, rapidly closing train doors and finding room for a double stroller - with eyes peeled on our girls - to the inevitable bathroom request, this sure turned out to be an experience! I found myself thinking like my wife and daughters "Are we there yet"? I simply couldn't wait. We finally arrived, but then a massive storm with strong winds enveloped. People ran for cover. Fortunately, my wife prepared for any eventuality and the girls were safe under a large tree which shielded them, (for the most part). Despite the weather the parade kept going and after 5 minutes, the rain and winds dissipated, the sun came out and we had a front row view of the parade procession. What followed was a really nice parade. Though there were many people, all were pleasant, friendly and courteous. There was a real sense of national pride - it was palpable in the air - as were the dozens of large and small Israeli flags. The theme of this year's parade appeared to be "Israel Branching Out" T-shirts that stated "Israel Est. 1948" and "Celebrating 64 years of national independence." The Jewish Diaspora seemed to congregate with ease; thank you NYPD for helping secure such a large event. Growing up on New York’s Lower East Side, I attended MTA (Yeshiva University's high school), Israel and then YU. Therefore, marching at the Israeli day parade was a historic pastime, and I was glad to have returned as a bystander observing the colorful displays, marching bands and cheerful mood that was unique to this year’s parade. Observing the diversity yet congeniality of our people was a refreshing sight. There were yeshiva bochrim wearing velvet yarmulkah's to leather kippa's to knit/srugi kippot. There were religious people marching standing next to, and easily conversing with, those that had no head covering. There were floats where we recognized some of our friends, others with live bands singing their love for the Land of Our People. My daughters were thrilled to recognize some of their classmates marching with religious and social organizations with whom their respective families are affiliated. I am reminded that every Jew, regardless of level of religious observance, has the pintele yid – which when ignited could light up the world. There were pro-Israel right-wing political parties and left-wing political parties - all seemed happy and united. Whether one is a practicing Jew or not, we all pray for peace and security. For Israel, however, this prayer may feel more obvious and warranted. Most importantly, the parade afforded my wife and I, as parents to inquisitive daughters, the opportunity to explain that indeed everything HSHM does in the world is and always will be good. That HSHM decided to allow the formation of the State of Israel, through UN votes from countries like the United States and Russia - both of which, during the onset of the Cold War, could agree to vote in favor of the formation of the State of Israel - was nothing less than a miracle. That Israel was triumphant, with the help of HSHM, defending herself with a fledgling group of native Jewish Palestinians, holocaust survivors and former U.S. & British soldiers, all united in the belief and disbelief against insurmountable odds - seven invading countries, is in fact a great miracle worth recognizing and celebrating. That there are great Rabbis in Israel who study Torat Eretz Yisroel and who are able to observe many mitzvot applicable to the Land of Israel – chief among them, Yishuv Eretz Yisroel – settling the Land of Israel. That there are Israeli soldiers, many fresh out of high school that had in the past and will continue in the future to lay down their lives to defend a fellow Jew regardless of his/her level of religious observance or political affiliation. We share a bond with our brethren: Those who learn and observe Torah and those who do not yet know how to learn Torah. That we recognize that despite ones outward appearance, a Jew is a Jew and that we must respect and help one another. We are one people with many different voices, many different mannerisms and modes of interaction. However, at the end of the day, when the parade ended, we longed to experience further instances of mass unity and mutual appreciation. Next time we will skip mass transit and opt for wheels to the parking lot. Nothing against people doing their own. However Dovid you disappoint me, I thought you were from the Chareidi camp, just not part of religeous coercion like myself. This picture & crowd shows something which doesn't exsist by Chareidim, & even 100 years ago in Germany where men & women shook hands, simchas & even clubs & shiurim were without mechitzos.However a man didn't sit between 2 girls, a girl didn't sit between 2 men. Girls sometimes even sung together with men. The Rabonim of Germany went through great pain being matir & maikel to keep the flock from drifting towards the haskolah. They knew how far to go, and the people would listen & succeeded. Many generations of Ehrlicher Yidden have come from that, albeit dispursed among other groups in Klall Yisroel. However they never mixed & shuved or danced together. I feel that although I agreed with you in the begining of your war against fraud & lies by the chareidim. The backlash you got back turned you all the way off from Chareidim, Rabbis, Rebbes & Roshei Yeshiva. I understand your feelings too, but as R' Meir Schapiro would teach his Talmidim how to say a drosho, [most were/are very good darshonim] never speak a minute longer than the crowd wants to hear, because every extra minut will undo 2 minutes of what they did hear. Having to fill up the 3 Chelms & still missing the 10 year old boy part. Having to name 101 questions, 10 lies etc, put you into a commiment you didn't need, and went beyond the issues.Kesheim shekibaltah schar al hadrisha kach kibaltah schar al haprisha, should have been told to you long ago. Eventhough you may be 1000% right in your argument, you still shouldn't have been Poiresh min hatzibur, many of the Rabonim & dignetories who attended, even the Bnei torah and laymen, attended for that reason only.Unfortunatly you dug yourself in too deep, and are having difficulty digging out. Please not to ruin thrgood work you started stay inside our machneh, because those on the outside have no relevence. i just watched ur IDP video including those two former sdei chemed guys screaming "S.C.!" vs "Torah" and as a former spiritual guidance councilor in S.C. I must protest to the "either-or", There IS Torah IN sdei chemed!